As I promised you in my previous post How to keep your car cooling system in perfect shape . . . part1!, here’s the second part of this series. As I’ve told you in my previous post, the content of this article will create a very very big wall of text that I’m sure many of you will hate to even look at it. So I decided to break it down into 3 parts. I will be posting the third (final) part tomorrow (well… I hope!). Before we begin, let me thank the original writer of this article Wayne R. Dempsey. I hope you will find the second part of this article useful. For those of you who didn’t read my previous post, please follow this link first before reading this part. It’s very important to check your coolant level regularly, as this will help detect leaks that can siphon off coolant and cause overheating in your engine. You should regularly check the coolant level in your coolant reservoir, making sure that it is within the prescribed High/Low marks. These marks are printed on the side of the coolant container. The container is slightly transparent, and you can see through it slightly to see the current coolant level. 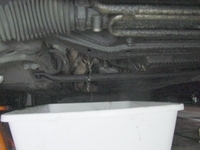 Your BMW will lose a little bit of coolant here and there over time due to evaporation from the reservoir. However, a significant loss of coolant over a very short period of time almost certainly signifies a leak in the system. Sometimes a leak can be seen when you park the car overnight. Often the coolant leaks out and then evaporates while you’re driving, leaving no tell-tale mark of coolant on the pavement. If you suspect a coolant leak, visually inspect all of the hoses, the water pump, the reservoir, and the radiator for seepage or the ‘weeping’ of coolant out of seams and gaskets. Check the seal on the radiator cap. Check that the radiator cap is fastened securely – the way the BMW radiator cap is designed makes it easy to make the simple, yet deadly mistake of leaving the cap cocked – allowing coolant to leak out when the engine is running. If you suspect a leak that you cannot see, a pressure test from a professional mechanic can verify the integrity of your system. If you can’t find any visible leaks and the system appears to hold pressure, then check to make sure that the cap is good, and is rated for the proper pressure. Verify that the cap you have for your BMW is the proper one for your engine. 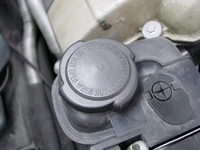 The following figure shows an example of a proper radiator cap for the BMW 3-Series 325is. If the system does not hold pressure, and you’re still at a loss where coolant might be disappearing to, then you might want to start looking in the oil. A faulty head gasket will often cause coolant to leak into the oil. 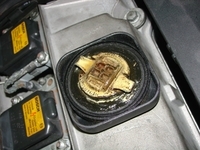 If you remove your oil cap and find a yellow murky substance, then you probably have a faulty head gasket. This figure shows an example of what this mixture looks like. 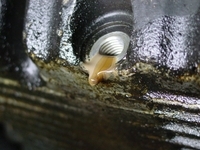 The oil level may be elevated and you will be able to see droplets of coolant inside the oil filler hole. If coolant is leaking past the gasket into a combustion chamber, you will see steam exiting out of the tailpipe, and the spark plugs will foul easily. In addition, the exhaust will be contaminated with the silicate corrosion inhibitors found in the coolant, and your oxygen sensor will be destroyed – plan on replacing it if you have experienced this problem. These figures show what your oil may look like after the coolant and oil mix together. 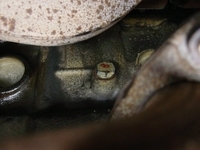 These figures clearly show drops of coolant after the valve cover has been removed. If you can’t discover what happened to the coolant, it may be because there was a temporary overheating problem and some of the coolant boiled over. In this case, top off the coolant and keep a very close eye on it. It’s not uncommon for BMW overheating issues to suddenly destroy a head gasket. You should periodically test the strength and condition of your coolant to assure that you have achieved the optimum balance for your BMW. This is just as important for protection against heat as it is for protection against freezing. An imbalance between water and antifreeze levels will change the boiling point and/or freezing point of the mixture. A 50/50 mixture of water and ethylene glycol (EG) antifreeze will provide protection against boiling up to approximately 255A?A? F (with a 15 psi radiator cap). This mixture will protect against freezing to a chilly -34A?A? F. On the other hand, a similar 50/50 mixture of propylene glycol (PG) antifreeze and water will give you protection from -26A?A? F to about 257A?A? F.
If you increase the concentration of antifreeze in your coolant, you will raise the effective boiling point, and lower the freezing point. While this may seem beneficial on the surface, having a antifreeze content of greater than 65-70% will significantly reduce the ability of the coolant to transmit and transfer heat. This increases the chances of overheating. As with most things in life, it’s a good thing to maintain a healthy balance. 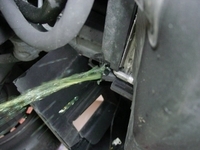 Beware – you cannot accurately determine the condition of your coolant simply by looking at it. The chemical composition and concentrations in the coolant are very important – if the chemistry is off, then your coolant may be harming your engine. As mentioned previously, it is important to keep the coolant fresh. The main ingredient in antifreeze, ethylene glycol, typically accounts for 95% of antifreeze by weight. It does not typically wear out, but the corrosion inhibitors that comprise the remaining 5% typically do degrade and wear out over time. Keeping the coolant fresh is especially important with engines that have both aluminum heads and cast iron blocks. I recommend that the coolant be changed at least every two years, or every 25,000 miles. I’m not a huge fan of long-life antifreeze – if these longer-life fluids are mixed with conventional antifreeze (a very easy mistake to make), the corrosion inhibitors react and reduce the effective protection of the long-life fluid. If you do have this long-life fluid installed in your car, only add the same type of anti-freeze to the car. Don’t mix and match regular and long-life fluid. Unfortunately, it’s tough to determine if your long-life coolant has been mixed or topped off with ordinary antifreeze. 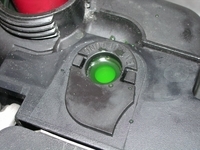 Although some coolants are dyed a separate color (like Dex-Cool in GM vehicles), when mixed with standard antifreeze, it typically isn’t enough to overpower the bright green color. In general, unless you know the entire service history of your BMW, it’s a wise idea to err on the side of caution, and use a shorter service interval for changing your coolant. Okay, so how do you check the coolant in your system? I recommend using little chemical strip tests that measure how much reserve alkalinity is left within the coolant. The test strip changes color when immersed in the coolant. You can then compare the final color change to a reference chart in order to determine the condition of the coolant. Obviously, if the coolant tests poorly or is borderline, you should plan on replacing your coolant very soon. An additional note – EG and PG antifreeze has differing specific gravities, so make sure that you use the correct type of test strip when testing your coolant. Otherwise, you may end up with false readings. I’m sure that everyone of you has faced a failure in your cooling system one way or another. This happens all the time and especially in BMW cars. I recall that I faced this situation couple times with my previous (precious) BMW E30. Luckily I didn’t face that situation in my E36 as I had to change my radiator couple months ago. I hope this will protect me from such failures for some time although the radiator is not the only thing that may fail . I want to keep your spirit high, so I’m not going to continue talking about these possible failures. Before we start, let me thank the original writer of this article Wayne R. Dempsey. Enjoy the post and please please don’t hate me if you find it a little longer than you expected. One often neglected task on many cars is the maintenance of the cooling system. In general, BMW recommends that you flush and clean out your cooling system once every 36 months, or approximately every three years. I like to perform this task on my own cars about once a year, or if I let it slip, once every two years. The reason for this is that old, exhausted coolant can actually cause irreversible damage to your engine components – I found this out firsthand when I recently replaced the head gasket on my ’93 325is. The previous owner didn’t look like he had changed the fluid once in the past ten years. As a result, there were many parts of the engine that were corroded and showing severe signs of wear. A properly maintained cooling system must have a few things in order: adequate supply of coolant, a radiator that acts as a heat exchanger with the outside air, a fan or air flow source, a water pump to keep the coolant circulating, and a thermostat to regulate the engine at its optimum operating temperature. The coolant must also have the correct mixture and chemical compounds to promote heat transfer, protect against freezing, and also inhibit corrosion. To keep your BMW operating correctly, it’s important to check the level, strength, and overall condition of the coolant on a regular basis. You also need to change the coolant before it degrades to the point where it doesn’t perform it’s job adequately. A fact that I keep hearing kicked around revolves around the reported findings of the U.S Department of Transportation, which states that cooling system failures are the leading cause of mechanical breakdowns on the highway. Not exactly surprising, since proper cooling maintenance is one of the most neglected areas of most cars. 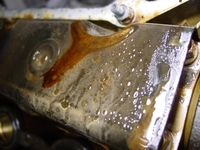 One failure mode associated with dirty coolant is known as electrolysis. 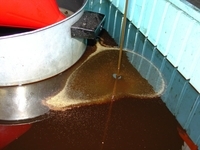 Electrolysis occurs when stray electrical current routes itself through the engine coolant. The electricity is attempting to find the shortest path, and impurities in the coolant often generate a path of least resistance that the electricity travels across. The source of this stray electricity is often from electrical engine accessories which have not been properly grounded. 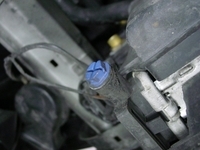 A missing engine or transmission ground strap can also cause the coolant to become electrified. Sometimes the path of least resistance becomes a radiator, a heater hose, or even the heater core. These components are often well grounded, and offer a ground path from the engine to the chassis by means of the semi-conductive path of the coolant. Electrolysis can destroy your engine quickly. Although it’s semi-normal to have very small amounts of voltage potential in your coolant system, values greater than about a tenth of a volt can start reactions between the coolant and the metal in your engine. In particular, electrolysis affects primarily aluminum engine components, resulting in pitting and scaring of the aluminum surface. 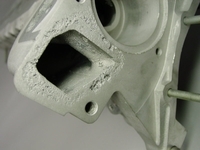 This eating away of the metal can cause coolant system leaks, and in particular, radiator leaks around aluminum welds. Cast-iron components are also vulnerable, but typically the aluminum metal parts fail first. On BMWs in particular, electrolysis can be easily seen attacking aluminum cylinder heads. 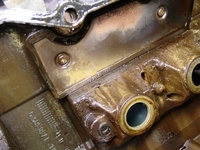 Figure 1 shows a picture of the thermostat area of a cylinder head that has been partially damaged by electrolysis. Notice how the aluminum has been eaten away, and eroded by the chemical/electrical reactions. The process works somewhat like electrical discharge machines (EDM). These machines work by passing a large electrical current through metal, literally zapping away bits of material until nothing remains. Unfortunately, the electrolysis process works in a similar way, zapping bits of metal in proportion to the amount of electrical current passing through the coolant. A poorly grounded starter can literally destroy a radiator or head within a matter of weeks, depending upon how often the car is started. A smaller current drain, like an electric cooling fan, may slowing erode components over many months. How can you test for electrolysis? Other than actually seeing visible signs of erosion, you can perform a current flow test. Connect the negative terminal of a voltmeter to the chassis ground. Test for adequate continuity by touching another point on the chassis – the resistance should be near to zero. With the engine cold and running, submerge the positive probe into the coolant tank, making sure that the probe does not touch any metal parts. The voltage should be less than .10 volts. If not, methodically turn off or unplug each electrical accessory until the reading reads below .10 volts. Have an assistant switch accessories (like the A/C compressor, heater blower, etc.) while you measure the voltage. If an accessory doesn’t have an on/off switch, test it by temporarily running a ground from the housing of the accessory to the chassis. Ground each component and check the volt meter. If the wire restores a missing ground connection to the accessory, then you’ve found a component with a faulty ground. During this test, be sure to check the starter. Not only will a poorly grounded starter struggle to turn over the engine, it will also zap away tremendous amounts of metal in your cooling system. Watch the meter carefully when starting the engine. Any voltage spike will indicate a faulty ground connection. Many people are rightly skeptical of coolant system additives – there are a lot of myths in the automotive industry. Luckily, the coolant system additives are in the category of good practice, for reasons I’ll explain here. It all begins with chemistry. Like today’s modern oils, many of today’s modern coolants incorporate some of the chemicals that help cooling and increase heat flow around your cooling system components. As more and more automotive components are made out of aluminum, and radiators become smaller, the use of these additives becomes more advantageous. Aftermarket coolant system additives are known as surfactants. What is a surfactant? A surfactant or surface active agent, is a molecule that has a water-loving end (hydrophilic and water fearing end (hydrophobic). Localized boiling of coolant in the cylinder head can create large shock waves that can wreck havoc on your engine, particularly on aluminum components. Without going into too much boring detail, these surfactants also help to reduce the amount of air in the cooling system, and also control the amount of foam within the system. In general, there are three main reasons why using these additives is beneficial to your cooling system. Firstly, they reduce harmful cavitations and foaming that may occur when your water pump is kicking out fluid at a rapid pace. This reduced foaming helps to prevent damage to aluminum surfaces. Secondly, the use of these additives aid in the transmission of heat from the coolant to the radiating surfaces within the radiator. Even if your car runs very cool, these additives add a extra level of protection in case a thermostat or similar component fails. Thirdly, the additives contain corrosion inhibitors. Most cars on the road have cooling systems that do not contain the ideal 50/50 water / antifreeze ratio that the antifreeze manufacturers design for. The additives help to minimize potential corrosion by maintaining adequate pH levels. Even if your antifreeze already contains surfactant additives, the use of these additional additives is typically beneficial because most cars are shortchanged on the 50/50 coolant/water mix. In general, the addition of these additives is cheap, and it’s a proven benefit too – no snake oil here. Using the additives on a perfectly maintained car can also provide a significant margin of error in case something goes wrong. BMWs are infamous for cooling system failures – keeping the odds on your side can prevent a costly head gasket replacement. It’s important to keep your cooling system at the correct pH as well. Water has a pH of 7 and is considered neutral. Battery acid is highly corrosive and has a pH of about 2-3, whereas baking soda is very alkaline, and has a pH of about 10-11. In general, you want to make sure that your coolant has a pH greater than seven. Any pH less than that will result in an acidic mixture, which will start to corrode your engine. The corrosion inhibitors in additives and antifreeze are added specifically to keep the pH above 7. A properly mixed 50/50 split between water and antifreeze will yield a pH of about 8-9. 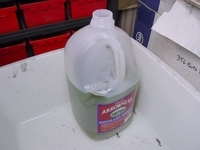 Over time, the glycol (one of the main components of antifreeze) will break down and degrade, creating acidic compounds. The alkaline corrosion inhibitors must be adequate enough to neutralize these acidic byproducts over the life of the coolant. Minerals in the water, heat, dissolved oxygen, and other factors gradually deplete the coolant of its corrosion inhibitors. Once gone, the mixture will become acidic, and will begin to eat away at your engine.